Begin your Madrid bike tour with a short orientation session to get your bearings. Then get pedaling on a sightseeing tour that takes you to Madrid’s top sights, including: the ancient Egyptian Templo de Debod, the Royal Theatre, Royal Palace, Almudena Cathedral, Plaza de la Paja, Plaza Mayor, Puerta del Sol, St Ann´s Square, Paseo del Prado, Retiro Park, Alcala Gate and Cibeles Square. Follow quiet back streets away from the city traffic, and ride through cycling paths, pedestrian zones and parks to discover Madrid’s out-of-the-way places. 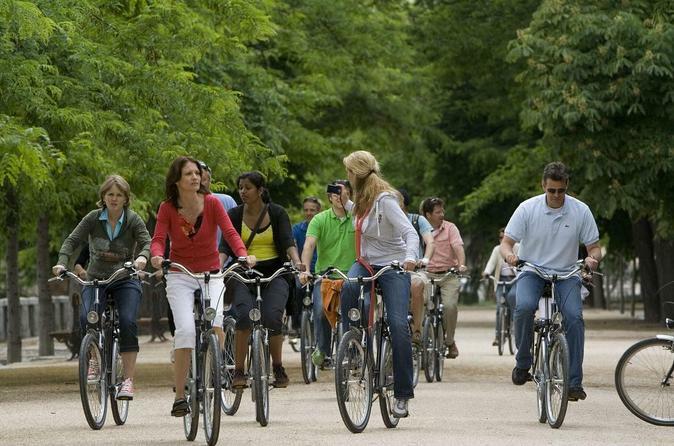 Sightseeing by bicycle is a fun and healthy way to tour Madrid, whether travelling alone or with friends. Gain useful tips about Madrid from your knowledgeable English-speaking guide, including advice on what to see and do in the city. Also hear tales from an insider about what it’s like to live in Spain's vibrant capital city. Get to know Madrid more intimately, from the famous must-see attractions to favorite out-of-the-way spots visited by locals. The tour follows a relaxed pace and includes rest stops for refreshments and photos. A comfortable, easy-to-ride bicycle is provided, along with an optional safety helmet.